Atheneum Books for Young Readers, 9781442430419, 56pp. 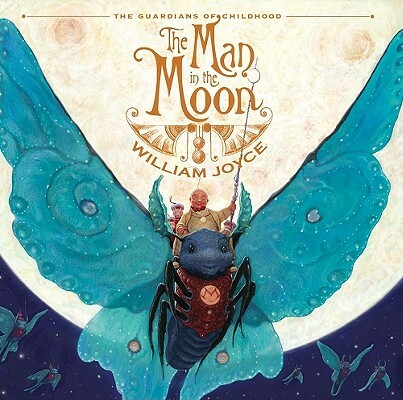 * "William Joyce invents a breathtaking landscape for his history of the original guardian of childhood: the Man in the Moon. As a baby, MiM, as he is called, travels the skies in a golden-sailed Moon Clipper with his mother, father and Nightlight, a kind of fairy godfather. Each night, the vessel transforms into the Moon. One day, Pitch, the King of Nightmares, with jet-black hair in up-floating coils as menacing as Medusa's snakes, hunts down this legendary child who has never had a bad dream. Nightlight whisks MiM away to safety, just before Pitch captures the child's parents. As Nightlight plunges his diamond dagger into Pitch's heart, an explosion results, and when MiM later reaches the Moon's surface, he sees the image of his parents etched in the stars. Their constellation offers MiM comfort, and the moon creatures rally around to educate and protect the baby. Joyce's fans will relish the parallels with his earlier tour de force about a mythic man in a magical land, Santa Calls. Santa rides in his sleigh; MiM flies on his moth. Santa learns of children's wishes through letters; their hopes and dreams travel to MiM by helium balloons. When MiM comes up with a solution to children's nighttime fears, he recruits the Moon's minions and his team of earthling Guardians (Santa, the Tooth Fairy, etc.). Pitch and Nighlight's fates will be the subject of subsequent episodes, but this first adventure in the Guardians of Childhood series offers a visual feast and a complete mythology of the Man in the Moon." --Jennifer M. Brown, children's editor, Shelf Awareness. STARRED REVIEW. This gorgeously strange picture book, the first in a projected series, traces the origins of the Man in the Moon, who, after losing his parents in a battle with the King of Nightmares, is raised by a retinue of giant glowworms and mice in tasseled sailor caps. Joyce’s shimmering images are at once adorable and otherworldly: a lunar moth bears the sleeping baby hero through space; at dinnertime, starfish swarm the sky.